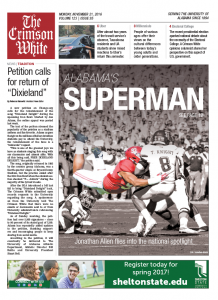 The Crimson White is the official student newspaper of The University of Alabama. It publishes twice a week on Monday and Thursday throughout the academic school year and continuously online. A multiple annual award winner, the paper was recently named a national Pacemaker and the best daily newspaper in the Southeast. More than 10,000 copies of each issue are distributed at more than 125 locations on and around campus.